NVIGEN 16-tube Magnetic Separation Rack (Cat# A20006), specially designed for efficient magnetic separation of all types of magnetic beads, is one perfect magnetic rack to assist in your magnetic beads based separation processes. The rack uses high performance rare earth permanent magnets. The magnetic surface is angled to precisely accommodate the slanted side of micro-centrifuge tubes. This allows bead pallets to form quicker and enhances the visibility of your isolation. The top rack can be easily detached from the base to allow vortexing, manual shaking or resuspension. Multiple samples can be handled in parallel enabling easy scale up of your protocols. Removable tube holder rack, ready for resuspension, vortexing or shaking. Compatible with all magnetic beads. 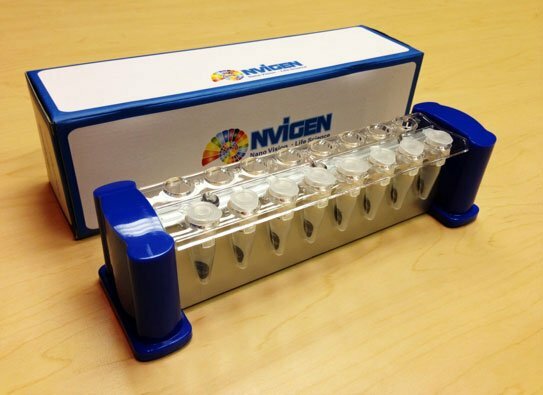 Spray or wipe Nvigen magnetic rack with 70% isopropyl alcohol for cleaning and disinfection. Do not submerge magnetic rack in water or aqueous solutions. Do not autoclave Nvigen magnetic rack. Nvigen magnetic rack is for research use only. Keep objects that could be damaged by the magnetic out of the working area. Handle the rack with care and avoid contact of the rack with other magnets. 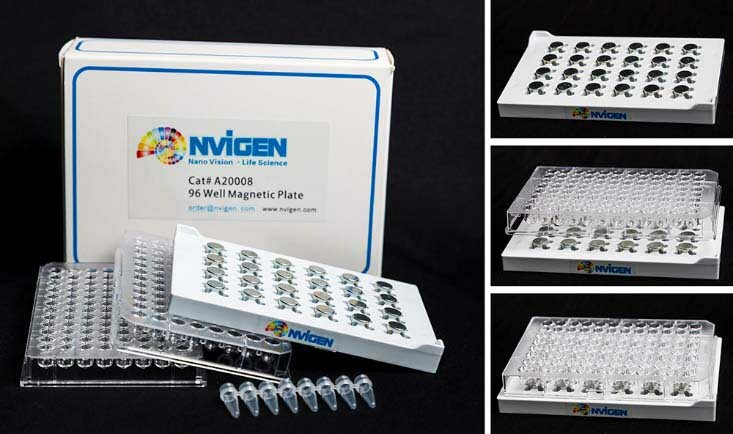 NVIGEN 96-Well Magnetic Plate (Cat# A20008) is optimized for efficient magnetic separation of magnetic beads for high throughput assays. The plate uses high performance rare earth permanent magnets, which pull down beads to the bottom edge of each sample and allow quicker beads pellet formation. Up to 96 samples can be handled in parallel enabling high throughput workflow.